The SuperPole™ System boasts the latest in transfer and standing assist technology with superior engineering. With the SuperPole™ as the central element, this enhancement accessory will live up to everything that the manufacturer promises. SuperBar™: A horizontal pivoting and locking bar that attaches directly to the SuperPole™. 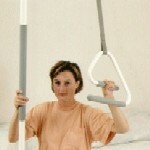 Designed uniquely for people who require moderate assistance to achieve small steps during transfer. Safety: Unlocks and pivots freely to move with you step by step, yet locks every 45 degrees to assist with standing and sitting. Automatically locks when released preventing forward or lateral falls. Full support when making two or three steps transfers. 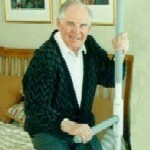 Versatile: Can pivot in narrow areas such as between bed and wall, narrow hallways, etc. Bed Application: Allows weight shift, moving, standing, leaving or getting into bed, or transfer to wheelchair, walker or bedside commode. 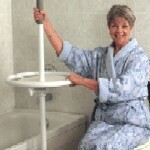 Bathtub Application: Provides complete support for step-over without reaching for wall bars. The SuperBar™ can pivot away from shower curtains, allowing them to fully close during a shower. Toilet Application: Permits pulling up to standing and can provide leaning support while managing clothing. Click here to view the SuperPole™. Ideal for either the bathroom or the kitchen, this accessory's circle handle design with solid center not only proves to be phenomenally beneficial as a standing device, but also as a traditional kitchen island. SuperTrapeze™: An offset trapeze handle that mounts to the SuperPole™. 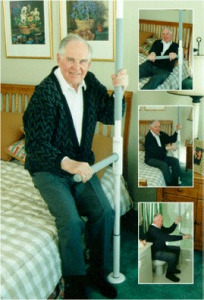 Suitable for clients who require moderate assistance to achieve a sitting position in bed, while still maintaining all of the benefits of the SuperPole™. 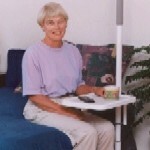 SuperTray™: Easily snaps on to the SuperPole™ to provide the convenience of a bedside or overbed table. The SuperTray™ is not to be used as a lifting device, rather as a table top surface.